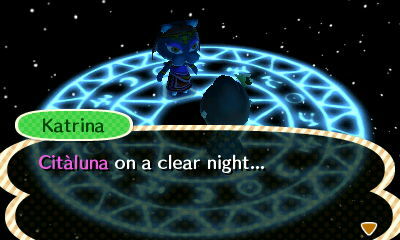 Luna Crossing | Luna's very own Animal Crossing town! 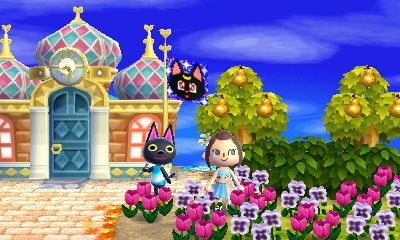 Long Time No Post…And an Update on AC: HHD! Wow…It’s been a long time since I posted. My dad is right – time moves faster as you get older! 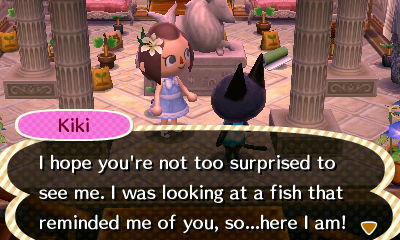 Anyway, I took a long break from AC to play some other video games like Pokémon, Fantasy Life, Bravely Second, Fallout 4, and a ton of Zelda games! I have also been in a TON of plays and musicals, which has been super fun! 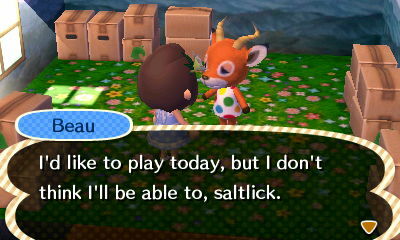 Anyway, I still have my town of Citaluna and I got AC: HHD last year, played it for a bit, and then got too busy to really get into it, so I am going back to it now! 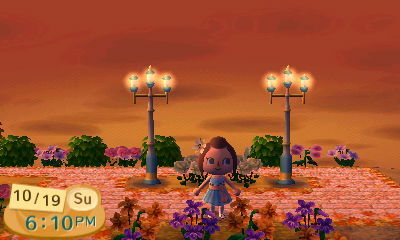 I’m hoping to do another update on Citaluna, but I need to rearrange the flowers and make the town more presentable, which is a horribly tedious task and I hate doing it (and growing the flowers I need). 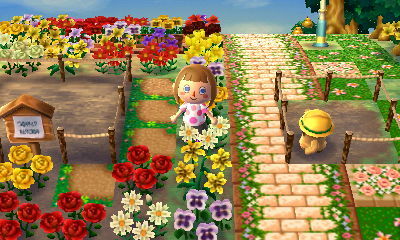 I’m going to try and go for a big dream address update in the spring so you can see Mayor Lenore and the town in all of its springtime glory! 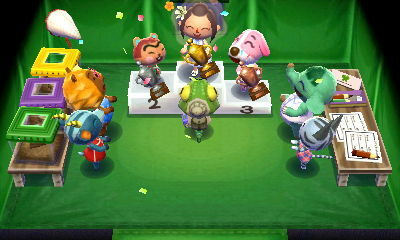 Anyway, this post is about HHD this time around and some of the designs I am really proud of and other things…well…need work! 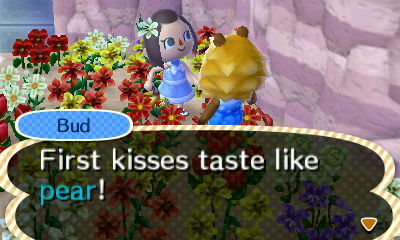 😛 My character’s name is Rose – I wanted to name her Lily (for my town, Lilywood), but there is a frog named Lily in the game already ( I hate duplicate names) so I switched to the name of my cow in Harvest Moon, Daisy. Oh wait, there is dog named Daisy in the game…ughhhhh 😦 . 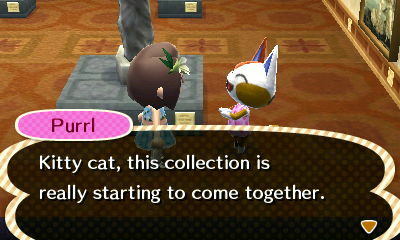 I came up with Rose, and I know there is a cat named Rosie, but they aren’t the same so I went with that (and “Designer Rose” has a nice ring to it!). 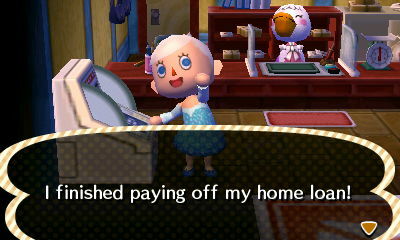 Lottie gave me the description “A lovely atmosphere” and lots of lovely furniture, so I got to work! Goldie wanted “a forest of books”, which I was super excited about. Not a ton of furniture to work with still, but getting there! Isabelle informed me the next day that we were designing a school! I have always loved academia and the past 3 generations of my family have been teachers, so I knew this was going to be fun! A lot of the stuff is pretty basic (chalkboard, desks, cubbies, etc. but these two areas are my favorites! I love the science corner! 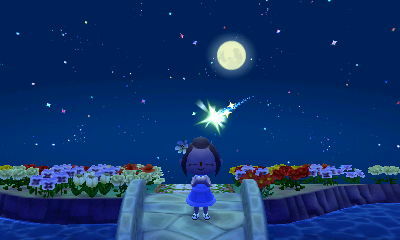 I originally had a burning oil lamp, but the child care provider in me said wasn’t safe, so I switched to a star globe. Social studies and language arts corner (with a lunchbox)! 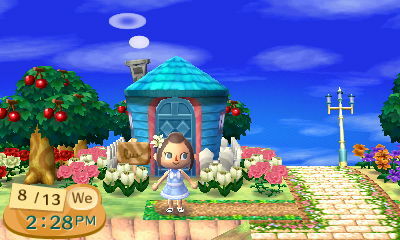 I chose the pink/blue exterior for the school, since blue is my favorite color! I love being able to chose the building styles! No more resetting for that! Carrie showed up the next day saying she wanted a “garden for her joeys to play in” – this one was exciting because I could pick the plot of land for the house to go on as well as the season! 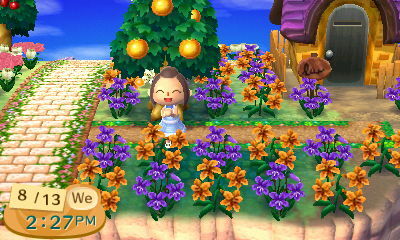 I chose the standard grass lot with the season of summer! I could also decorate the outside as well as the inside! I’m at the age where a lot of my friends have kids and what I hear is that they are always tired, there is tons of laundry and cooking to do, and the house is NEVER clean no matter what you do…and their kids are their pride and joy! I think this house captures that perfectly! The outside turned out great! A place for the joeys to play while mom does the laundry and watches them! I got to design Colton “a noble palace” which was fun! 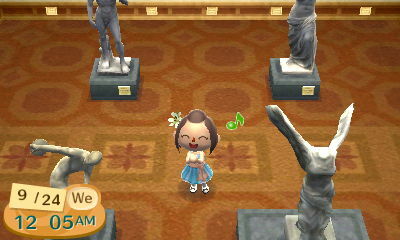 I was hoping for some more ornate furniture, like the princess series, but no dice. 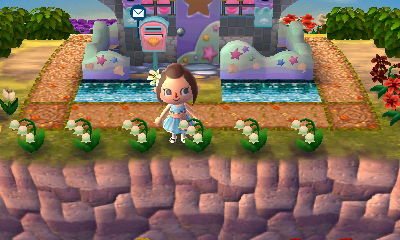 It still looks like a palace though ( and of course I had to go for the moat land plot!) and the fall theme goes super nicely with the golds and the reds to represent royalty! Colton looks out over his kingdom! I wanted apple trees to go with the red roof, but the stupid things wouldn’t fit 😦 I had to go for mini trees and red carnations, which still look nice (plus the rainbow!). 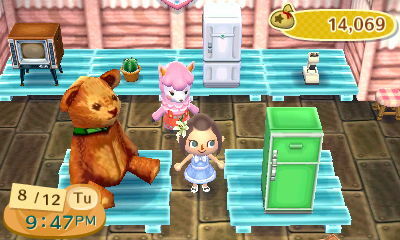 Tangy showed up and I had make her a house, since I LOVE cats! I think I will come back to this one later and give it some updates, but it’s a good start! I like the outside more than the inside for this one actually. I wish the four fruit drinks on the table showed up a little better because they are so cute! 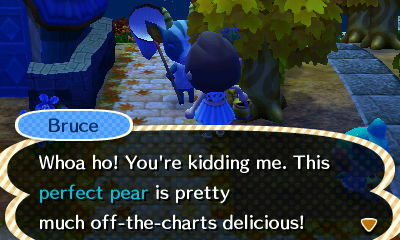 I didn’t even need to do too much with the outside of the house itself, except change the roof to orange – Tangy’s favorite fruit and color! First look at her new place! So many pretty plants to work with! And I love the Imperial ceiling lamp! 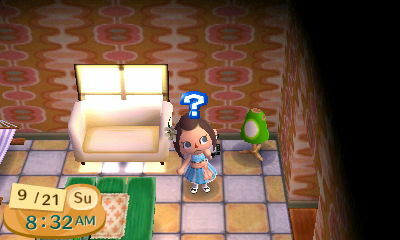 Muffy wanted a gothic style room with rococo furniture! 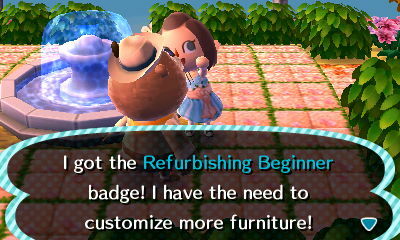 I had just gotten the furniture customization ability so I was super excited to try this out! 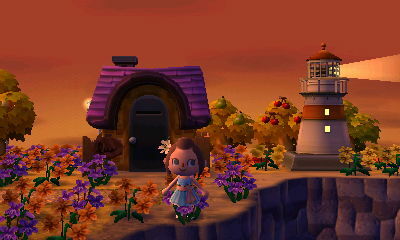 I chose to put her house on the edge of a cliff with stormy weather. A gothic mansion seemed very fitting for her, so I went with that for the exterior and a purple/grey theme for outside (like a spooky witch-like house)! I was annoyed that there weren’t any black flowers for outside yet, but then I discovered that I had potted black lilies as decorations and I could put them outside! They almost look like graves, which just adds to the spooky gothic atmosphere of the house! I even left the lights off so the black rococo candlesticks show up! And the black chandelier looks so cool in the dark! I love the eerie purple lighting you can see through the windows! 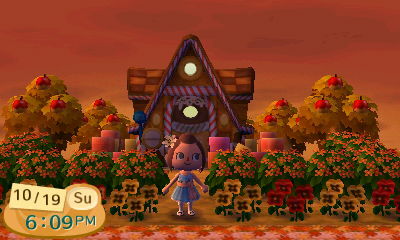 I talked to Deirdre and she wanted an autumn themed house! 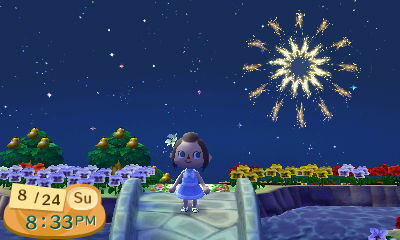 This is something I have done before (Autumn’s house in Citaluna), so I knew I could rock this! 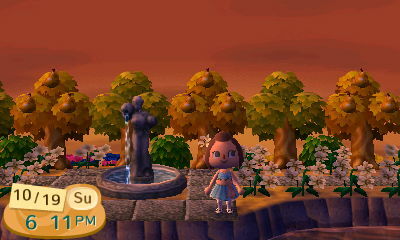 Overall, it turned out great – I may add some more flowers to the area by the swing though since it looks a little off. It was tough to decide on furniture, but I then I discovered that the you could redesign the cabin series to have a birch bark finish and it looks so pretty with the fall leaves! A cozy autumn home overlooking the fall colors! Ali wanted “a mushroom manor” and since I was already in fall house design mode, I figured this would be quick and easy. 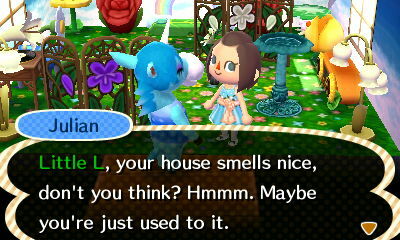 I’m glad I decided not to use all the mushroom furniture for Deirdre’s house! Mushrooms, mushrooms, and more mushrooms! I was even able to make her house look like a cluster of big mushrooms tucked into the side of the cliff! Outside looks much better! Love the pink trees! At least I got purple pansies! At least the outside is kinda pretty! After two disappointing houses in a row, I needed a break from house designing so I decided to try my hand at designing the café! I really had fun with all the new food items and I love the way it turned out! The HHA staff loves the new café! Those pastries and that ice cream look sooooooooo good! After having so much success designing the café, I wanted to keep my momentum going so I went straight to work designing the hospital! The hospital had 3 rooms for me to design, which was a little intimidating but I took it one room at a time and it got easier the more I did it. Another angle of the waiting room from the reception counter. The patient’s ward complete with everything they and the staff need to treat anything! A different angle of the patient’s ward. The doctor’s office – not a whole lot in here since it is small but you get the idea. 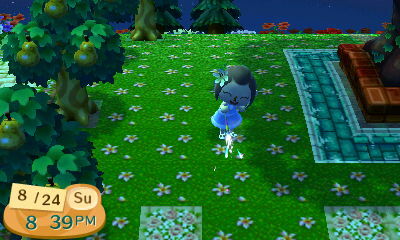 Mint is super adorable in her nurse outfit as well! Exteriors of the hospital, school, and café! 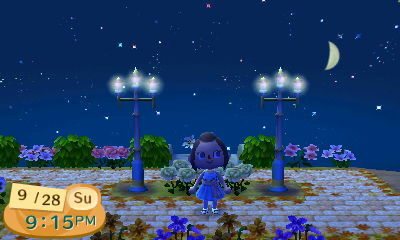 Going for a pastel blue/pink theme! Oh boy…I should have known what I was getting myself into when I decided to take Chrissy’s request. So…much…pink! My eyes actually hurt after designing this room due to the bright colors. Still trying to figure out what to do with the outside, but I just did the inside because I was getting a headache! The blue is pretty bright as well! I love blue and pink as a color combo, but this is WAY too much pink! It suits Chrissy very well though! I’m looking forward to designing Francine’s pretty blue house! 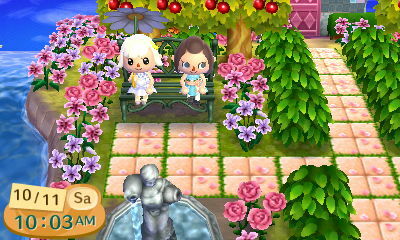 Mint showed up in town after I finished the hospital and requested her house be an ice cream shop! 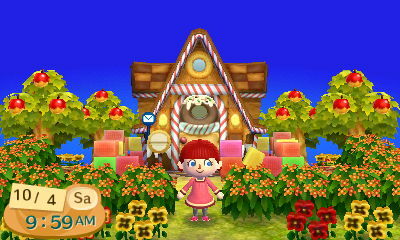 This is one of my favorite houses, even though it looks similar to the café! And mint one of my favorite colors and ice cream flavors! Getting a first look around! Similar to the café…maybe I’ll change the wallpaper if I find one that fits better. I love the outside! I could spend all day eating ice cream here! -Not having to store furniture in houses, museums, etc. and worry about space. It’s all in one handy menu and you can search for things. 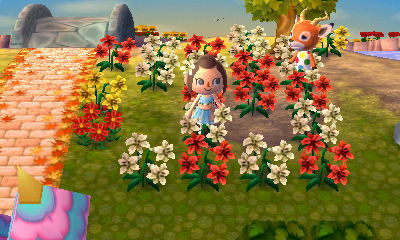 -Landscaping is so much easier when all the trees and bushes are already full grown and you don’t have to wait 5 days to figure out if you like your landscaping (and if you don’t, HHD makes it super easy to fix)! 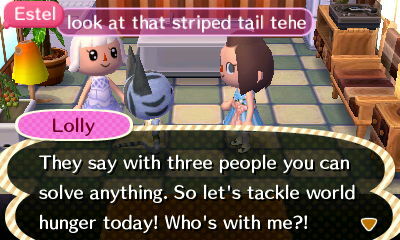 -Each villager has a unique request and you can see their personality and learn more about them! 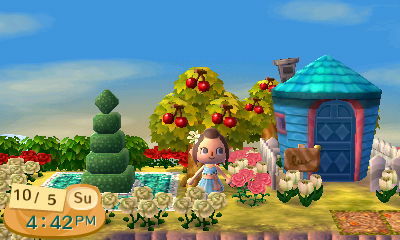 -The spacing for landscaping is a bit different (this one REALLY bugs me) and it’s annoying you can’t put flowers directly in front of houses. Changes Ahead! 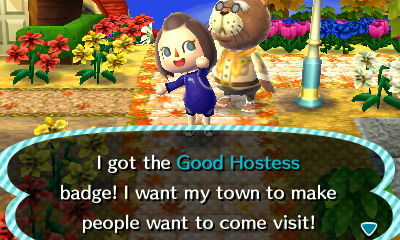 (For me and my towns)! 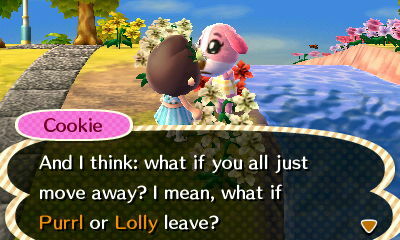 Shush Cookie! You’ll jinx it! 😛 I have all of my dreamies and no is going ANYWHERE! 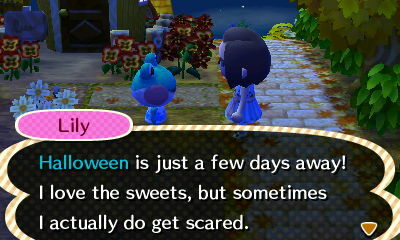 Awwwww….Lily is so cute! 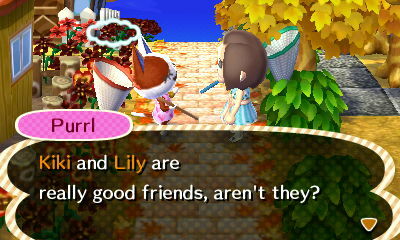 It’s ok, Lily! I don’t like super scary stuff either! 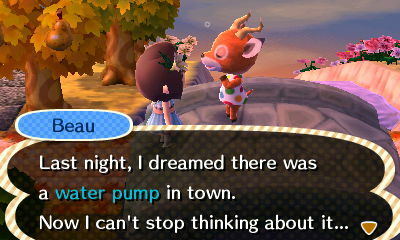 Beau suggested a water pump…I actually ended up using it and it’s pretty cute! I put it by the bridge across the path from Melody’s house. A place to get some fresh water for the picnic perhaps? Purrl noticing all the new artwork I have donated 😀 Maybe Bud should take Purrl on a date to the museum? It’s right by Melody’s house! 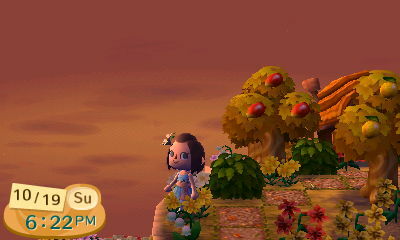 I FINALLY got my first fiery sunset ever in Citaluna! It came a great time too because all of the trees and grass where gold colored and the perfect golden pear trees looked soooooooooo pretty against the pretty orange sunset! 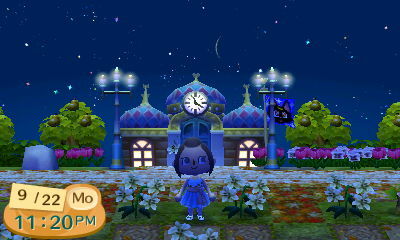 Town Hall, the court area by Kiki’s house, and Kiki’s house and the lighthouse! 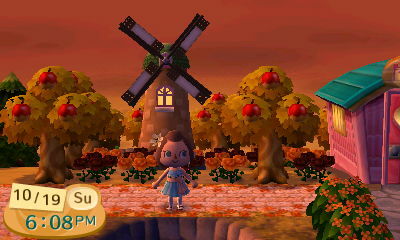 The bell, Autumn’s house, the windmill, and overlooking the beach by Bud’s house! I had Lilah come visit so I could fix her hair! Not too exciting…Hopefully I’ll have some more eventful things to write about next time! 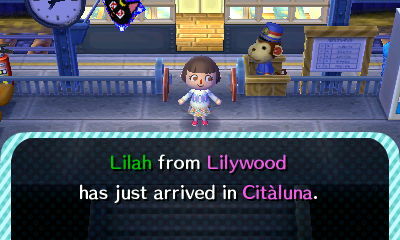 Still working on Lilywood too, but I’m going to try and finish Citaluna before getting too involved in that! 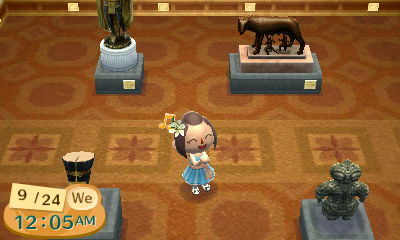 I’ll work on my rooms some more! 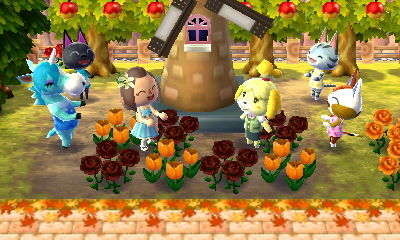 It may be a bit before my next post since I’m going to try and finish Lenore’s house before my next one, but we’ll see 🙂 I also now have to split my time playing Fantasy Life and AC:NL because they are both so fun! And Harvest Moon: The Lost Valley just came out and Pokémon Alpha Sapphire and Omega Ruby are coming out soon! So many games…so little time! 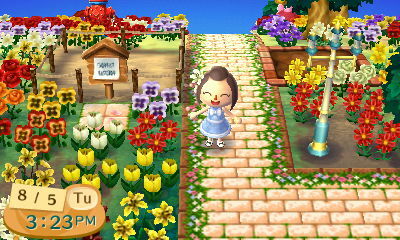 FINALLY Found a Map I Like for Lilywood! 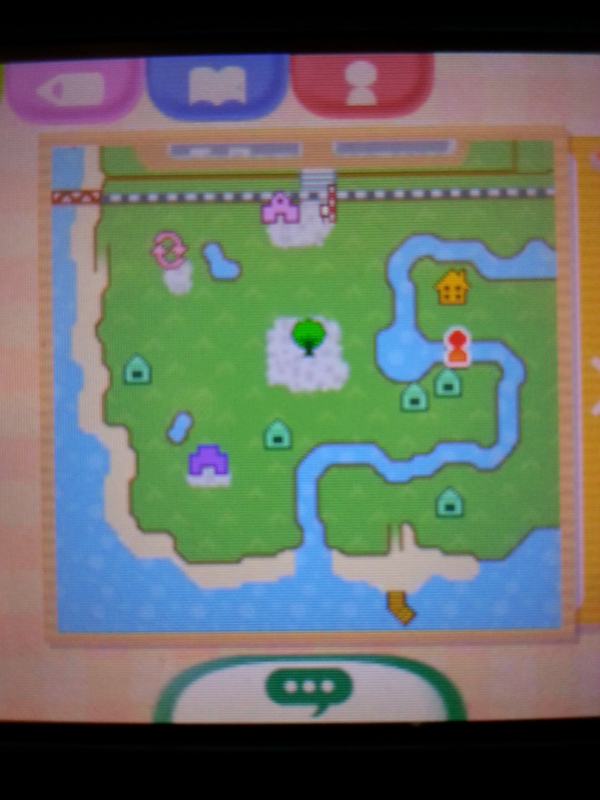 I’ll be doing another update for Citaluna sometime later this week, but I wanted to share that I found my town map for Lilywood! It’s not exactly what I had in mind as far as the river (really winding), but it met all my specific requirements: apples, visible waterfall, town tree not next to train tracks, town hall not near wall, no brown/red train station, no brown town hall, and a vertical beach ramp w/large landing area. I kinda wanted a blue town hall but I got the grey one, which looks almost identical plus I do want it to be different from Citaluna. I also am not a huge fan of square grass, but Amy made a good point saying that avid landscapers like us often cover the ground in flowers anyway, so you don’t even see the grass! I’ll post some pictures of Lilah once I find some better clothes and fix her hair. I’m thinking the bun hairstyle with purple hair and a pink lily 🙂 She has the same eye shape as Autumn but her eye color is going to be green (I don’t like a lot of the eye shapes, so I figured I would just double up and use features to make them different). Anyway, this is my map! (I’m standing on the bridge in this screenshot-don’t have my permit yet so can’t get a good shot on the top screen yet). Hopefully I’ll get a dream address soon 🙂 Time to start collecting dreamies! I’ll write about them in my next Lilywood post! I’m hoping to be updating more frequently now, especially since there will be lots of new things added (and a few things demolished). I don’t have to spend copious amounts of time plot resetting, so that should make my updates more frequent. A few quick notes: -My dream address changed (again…). It is now 4200-4705-7130 but it has been updated! I updated before I started making all the big changes and I will update again when I am finished with them 🙂 -I will be at home (which means I have wifi 😀 ) this coming weekend (10/10 – 10/12) and next weekend (10/17 – 10/19), so if you want to wifi, tell me and we’ll see if we can find a good time 🙂 -I am looking to grow more blue roses but I just have the one so far, so if anyone has any tips on growing blue roses, that would be awesome! 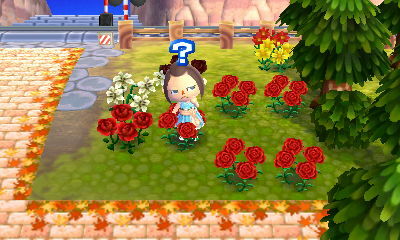 If I could get one more blue rose, I could breed those two, but no luck yet…Also still need gold roses but I’ll need to start my second town first, which reminds me… -Hoping to start Lilywood soon, but, as always, I find myself being super picky…It’s also super annoying that you only have a 1/5 chance of getting apples, which is my main requirement for Lilywood. 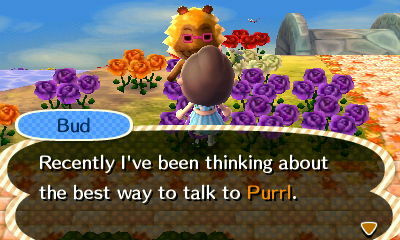 Hopefully I’ll find a town soon! I want to start growing gold roses and more hybrids! 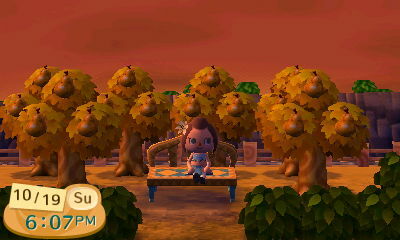 I’ve had Autumn in my town for awhile, but have not gotten around to doing too much with her until now. I finally came up with some concept ideas for Autumn (beyond the fall theme, which is very broad). 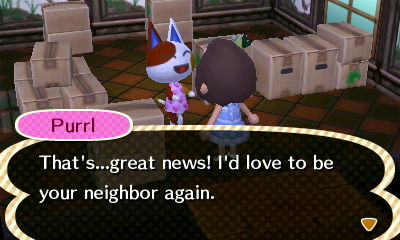 I want her character and house to have a “country style” and “harvest” feel to it (of course with one room of Halloween furniture). I love the combination of her bright blue eyes (color of the fall sky) with her orange/red braids (the color of the changing leaves). The braid hairstyle also strikes me as very “country” as well. 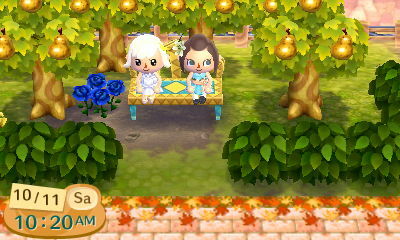 I still need to upgrade her house to a castle so I can have a castle for every season. 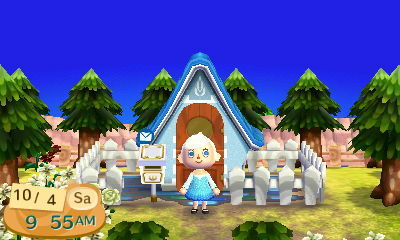 Noelle FINALLY gets to move out of her tent and into a house 😀 It needs a few more renovations to the outside (blue arched fairytale door and a fancy fence), but it’s coming along nicely! I’m thinking of changing her hair color to light blue, but we’ll see. I like the fancy hairstyle since it reminds me of getting dressed up for holiday parties! Noelle’s concept is going to be Holiday party/snow themed with maybe a cozy library and/or a bathhouse for relaxing on those cold winter nights. I’m also toying with the idea of a star room, since the stars are often out early and very bright during the winter, but we’ll see! 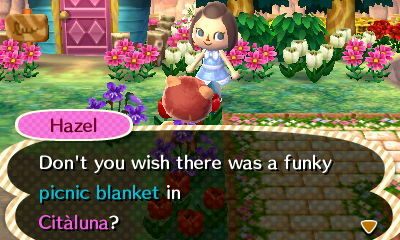 Villager Happenings Not a ton of villager happenings in this post, but I’ll put up the few I have! 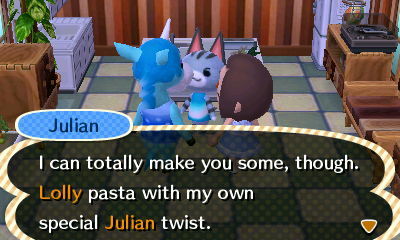 Well, Julian, we are in my spring/flower room so that MIGHT have something to do with it! Lots of stuff has been happening around town! This cardboard table appeared at my retail this morning! 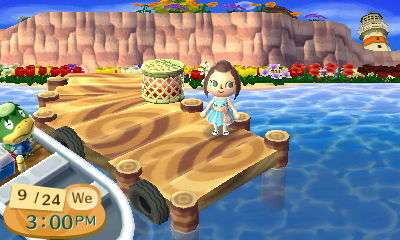 I love how you can see the lighthouse from the dock! 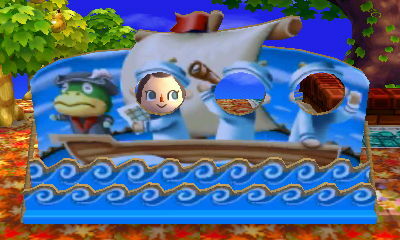 Helps Kapp’n see at night! 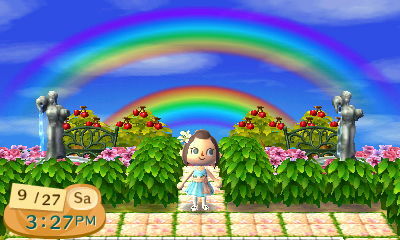 The first double rainbow I’ve seen in Citaluna! 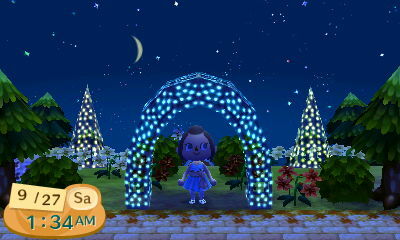 Finally finished Noelle’s winter illumination garden! Need to add a few more white/blue flowers and put down some cool patterns once the snow falls! Town hall was especially pretty that night! Love the tiny crescent moon! 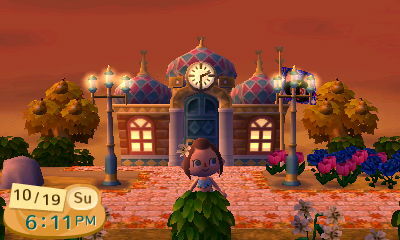 I want to put in blue roses with the pink tulips to match the town hall roof! One of my favorite spots in town! I put this fence in as a garden for Resee, but there is too much fence and not enough garden and it takes up a lot of room. Plus the fence is sort of ugly…(it looks good in other towns filled with fruit baskets and such, so I think it’s just that the space is too small). 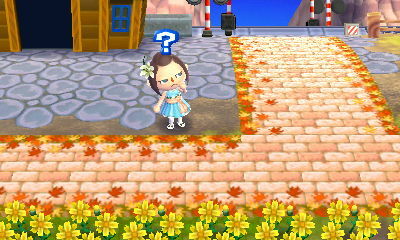 I also could not find any pumpkin patch or vegetable garden qr codes. 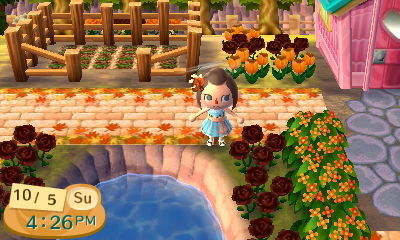 I’m thinking of putting a windmill here (kind of nice fall PWP) and then putting some flowers/bushes/trees around it. I’m going to move these topiaries somewhere else. 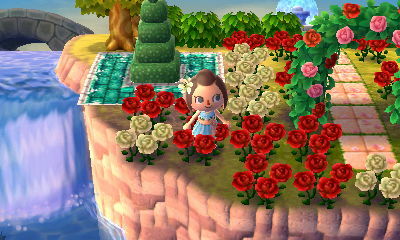 The water pattern around them sticks out (it really bugs me) and I want more room for roses and trees since it’s a rose garden. I want the flower arch to be the center of attention since it has all the roses on it! 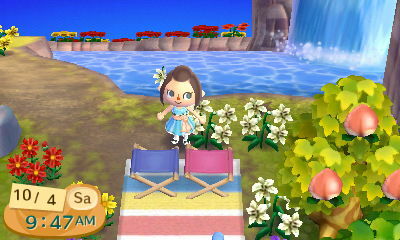 I just came up with this idea for the area surrounding the river on the other side of Lenore’s property! 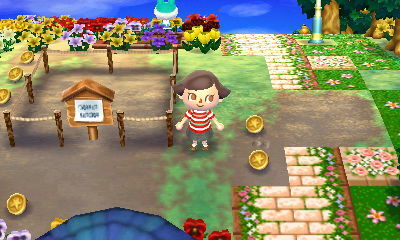 I’ll have to see how it turns out, but I’ve got some landscaping and PWP ideas I am excited to try! I’ll update and post pictures as it develops! And the other side in front of the train station. I’m going to need to use patterns since there is no room to plant/build anything. The flower clock is just below the yellow cosmos. I keep meaning to update more often, but I either a)don’t have enough interesting things to post about or b)life happens-this past month, I moved back up to school for the semester. I will only be able to wifi up here occasionally because the 3ds does not support my school’s wifi, so if I want to wifi, I’ll have to go to a friends’ house off campus (or when I go home for the weekend) 😦 But enough business for now! 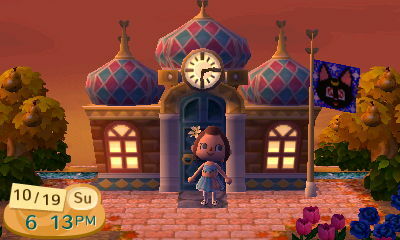 My town makes more progress everyday and lots of stuff has happened since my last post! 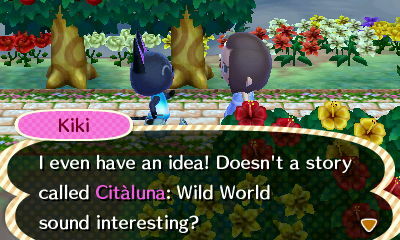 About time this got suggested…now to get that wisteria trellis from her and Cookie STILL needs to suggest the fairy-tale bridge!!! 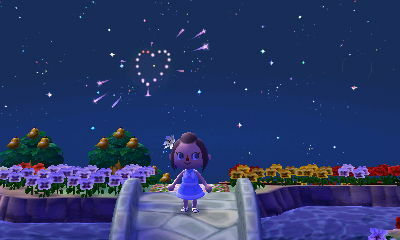 Enjoying some of the wonderful fireworks and meteor showers that happen in summer! Really missing these, but the winter season will bring auroras! 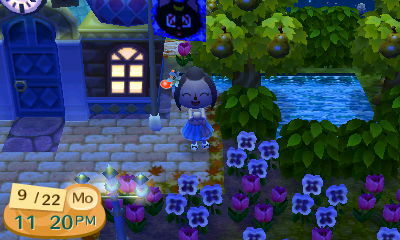 My first blue rose!!! 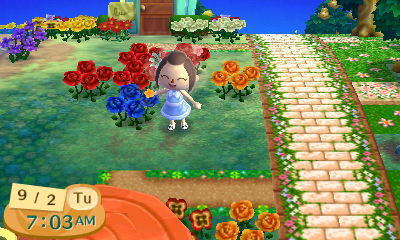 Now if I could only get one more, I could breed them and have tons of blue roses! They are really tough to get even with the special red offspring (about a 5% chance). Got Bruce moved in without too much trouble! 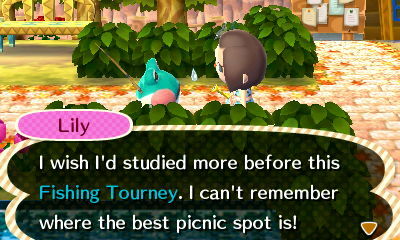 I was getting super frustrated after about a week (I don’t know how Amy did this with Pango for practically a month! I was going crazy after a week! 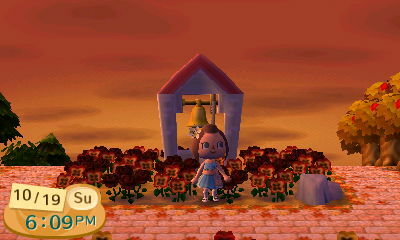 )I removed the PWP and started putting bells in the area I did not want him to move. I think they can still move on top of them, but it makes it less likely maybe? 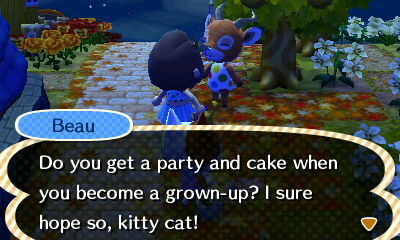 Regardless, I got Beau into his new spot at last! Welcome Beau! I love his house! Reminds me of late summer/early fall with the mountains/wildflowers! 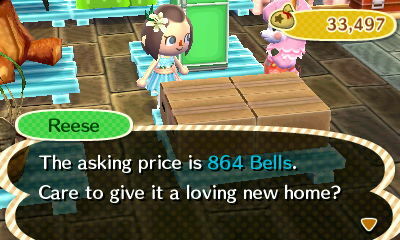 This means that Noelle can finally move out of her tent, I’ll have 10 more spaces for patterns, and I can stop putting flower beds everywhere for house repellent! 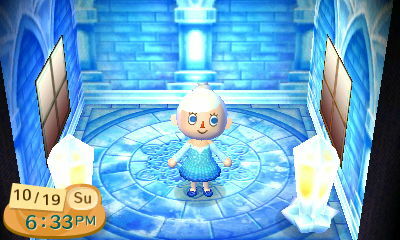 I can’t wait to do the next post when I will have Noelle’s house starting to look like a winter castle! 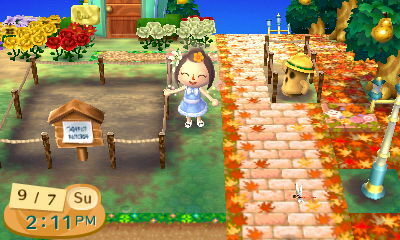 I’ve been focusing mainly on the outdoor part of my town and I hope to finish that soon so I can start decorating rooms! 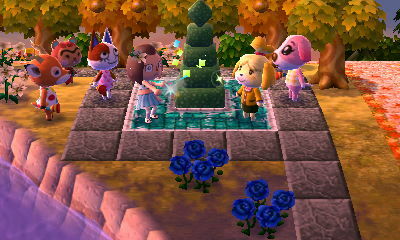 I think I am going to name my mayor character “Lilah” and have Misty and Musetta be residents. 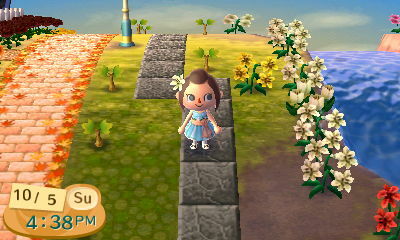 I am still going back and forth between Lilywood and Starpass, but I think I am leaning a little more toward Lilywood because there are so many pretty garden/path patterns and PWPs I want to use. 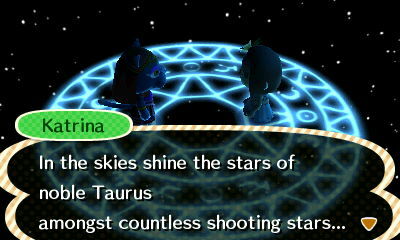 Plus I already have Citaluna, which is named after Luna the moon cat from Sailor Moon, so I feel like naming the town Starpass might be a bit too similar. I also like some of the alternate names I came up with for Lilywood (listed below so check that out too). Hopefully I’ll have a final verdict soon!